In the future, NASA hopes to send another mission to this system to further explore these plumes and the interior of Enceladus. This mission will likely include a new instrument that was recently announced by NASA, known as the Submillimeter Enceladus Life Fundamentals Instrument (SELFI). This instrument, which was proposed by a team from the NASA Goddard Space Flight Center, recently received support for further development. 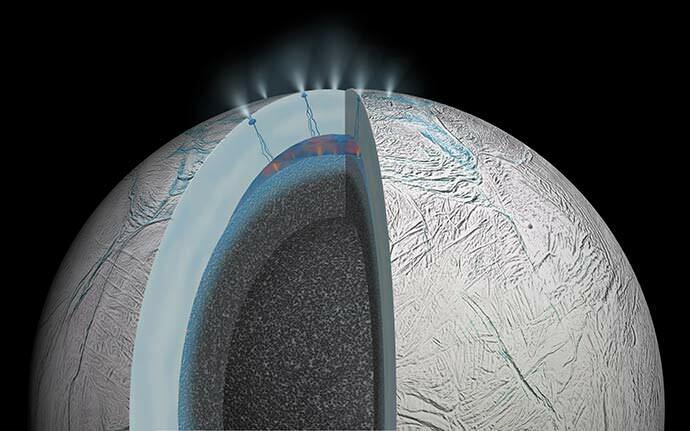 Prior to the Cassini mission, scientists thought that the surface of Enceladus was frozen solid. However, Cassini data revealed a slight wobble in the moon’s orbit that suggested the presence of an interior ocean. Much like Europa, this is caused by tidal forces that cause flexing in the core, which generates enough heat to hold liquid water in the interior. Around the southern pole, this results in the ice cracking open and forming fissures. The Cassini mission also discovered plumes emanating from about 100 different fissures which continuously spew icy particles, water vapor, carbon dioxide, methane, and other gases into space. To study these more closely, NASA has been developing some ambitious instruments that will rely on millimeter-wave or radio frequency (RF) waves to determine their composition and learn more about Enceladus’ interior ocean. According to SELFI Principal Investigator Gordon Chin, SELFI represents a significant improving over existing submillimeter-wavelenght devices. Once deployed, it will measure traces of chemicals in the plumes of water and icy parties that periodically emanated from Enceladus’ southern fissures, also known as “Tiger Stripes“. In addition to revealing the chemical composition of the ocean, this instrument will also indicate it’s potential for supporting life. Molecules like water, carbon dioxide and other elements broadcast specific radio frequencies, which submillimeter spectrometers are sensitive to. The spectral lines are very discrete, and the intensity at which they broadcast can be used to quantify their existence. In other words, instruments like SELFI will not only be able to determine the chemical composition of Enceladus’ interior ocean, but also the abundance of those chemicals. For decades, spectrometers have been used in space sciences to measure the chemical compositions of planets, stars, comets and other targets. Most recently, scientists have been attempting to obtain spectra from distant planets in order to determine the chemical compositions of their atmospheres. This is crucial when it comes to finding potentially-habitable exoplanets, since water vapor, nitrogen and oxygen gas are all required for life as we know it. Performing scans in the submillimeter band is a relatively new process, though, since submillimeter-sensitive instruments are complex and difficult to build. But with help of NASA research-and-development funding, Chin and his colleagues are increasing the instrument’s sensitivity using an amplifier that will boost the signal to around 557 GHz. This will allow SELFI to detect even minute traces of water and gases coming from the surface of Enceladus. Other improvements include a more energy-efficient and flexible radio frequency data-processing system, as well as a sophisticated digital spectrometer for the RF signal. This latter improvement will employ high-speed programmable circuitry to convert RF data into digital signals that can be analyzed to measure gas quantities, temperatures, and velocities from Enceladus’ plumes. For instance, in recent years, scientists have spotted plume activity coming from the surface of Europa. Here too, this activity is believed to be the result of geothermal activity, which sends warm water plumes from the moon’s interior ocean to the surface. Already, NASA hopes to examine these plumes and those on Enceladus using the James Webb Space Telescope, which will be deploying in 2019. Another possibility would be to equip the proposed Europa Clipper – which is set to launch between 2022 and 2025 – with an instrument like SELFI. The instrument package for this probe already calls for a spectrometer, but an improved submillimeter-wave and RF device could allow for a more detailed look at Europa’s plumes. This data could in turn resolve the decades-old debate as to whether or not Europa’s interior is capable of supporting life. In the coming decades, one of the greatest priorities of space exploration is to investigate the Solar System’s “Ocean Worlds” for signs of life. To see this through, NASA and other space agencies are busy developing the necessary tools to sniff out all the chemical and biological indicators. Within a decade, with any luck, we might just find that life on Earth is not the exception, but part of a larger norm.